The Garreteer Guide is intended as a weekly list of “Third Programme” level art and literature events taking place in UK towns and cities, on BBC radio, and online. If you are organizing an event, especially if you are doing so outside the main urban centres, please let me know on james@garreteer.co.uk and it will be considered for inclusion in the next list. 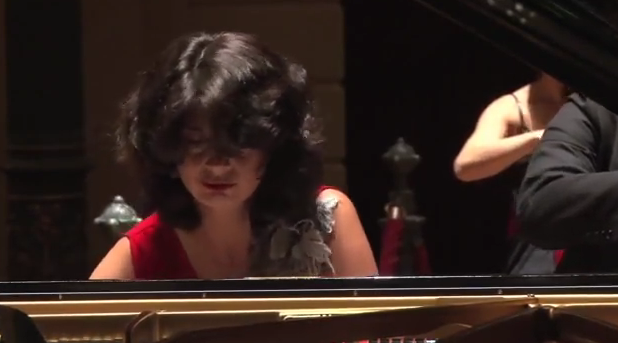 Radio 3: on Wednesday 4th June at 7.30, pianist Khatia Buniatishvili will play Brahms (3 intermezzos), Ravel (Gaspard de Nuit and La Valse), Chopin (Scherzo No. 2 in B flat minor Op.31) and Stravinsky (3 movements from Petrushka) live from the Queen Elizabeth Hall on London’s South Bank. Radio 4: 9pm, Friday 6th June. New Century, New Enemy: the first part of Admiral Lord West’s new history of the Royal Navy in the twentieth century covers 1900-1939, the Great War and the world-changing switch of the Navy from coal fuelling to oil. Little Atoms: first broadcast last week, Little Atoms interview Andrea Hart, Special Collections Librarian at the Natural History Museum, and essayist/novelist Geoff Dyer whose new book “Another Great Day at Sea: Life Aboard the USS George H W Bush” was published this spring. Listen below. The Kelvingrove, Glasgow: “How Glasgow Flourished”, a tour of Georgian Glasgow through paintings, engravings, documents, industrial exhibits, costumes and more. Click here for more details . The City Art Centre, Edinburgh: “Capital View: The Art of Edinburgh” (EDITOR’S CHOICE). Three floors of paintings, drawings and photographs telling the story of one of Europe’s most beautiful and fascinating cities from the beginning to the present day. Click here for more details . Not a physical exhibition but unmissable online, from Manchester Galleries comes this Flickr curation of images of Victorian and Edwardian Ancoats. National Museum Liverpool: Victorian and Edwardian art pioneer James Hamilton Hay’s drawings and etchings of the landscape and city, including scenes of Lime Street Station, St George’s Hall and Runcorn Bridge. Click here for more details. At the National Portrait Gallery in London, The Great War in Portraits. The Staffordshire Hoard is made up of over 1500 pieces of gold and silver items from the seventh century Kingdom of Mercia. It is currently being conserved and you can see the latest results at Birmingham Museum’s Staffordshire Hoard exhibition. Bristol Museum and Art Gallery have recently rehung their spectacular collection of late nineteenth century French art. The National Museum in Cardiff is the first venue of a projected seven to display Constable’s saved-for-the-nation Salisbury Cathedral from the Meadows. Staying with Constable for the moment, the Laing Art Gallery in Newcastle offers Turner and Constable: Sketching from Nature. Chichester Cathedral, 6.30pm Friday 6th June, organist Timothy Ravalde in concert. Weather permitting, on Saturday 6th June, at 5.15pm. the choir of Durham Cathedral will be singing from the Cathedral Tower. A project is underway to put the entire Studs Terkel radio interview archive online: in the meantime, here are 100 or so interviews to start, and here are the audio interviews behind most of his great books. Fritz Lang’s “M”, starring Peter Lorre and telling the story of a Berlin in a state of panic over a series of child murders, shows just extraordinary use of sound in film. One has to remember that some of the simplest of sounds, so evocatively captured – the flick of a lightswitch, the door to a modern apartment block swinging to, a telephone – lie on the opposite side to us of World War II and all it contained. This is the new restored version, courtesy of the essential Open Culture. Nino Gvetadze, with the Georgian Sinfonietta conducted by Markus Poschner, takes on Beethoven’s 4th Piano Concerto. To commemorate the tragic loss of a long run of the great Victorian and Edwardian arts journal The Studio, here are Edwardian volumes 11-13 digitized in colour and free to read online.